Guitar amplifier with usb. Mmc. Fm and mic with echo. The better the amplifier is, the better is the tone produced. 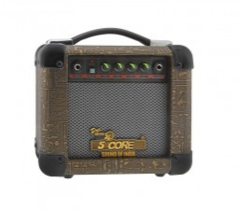 5 CORE brings you its finest collection of Guitar Amplifiers that lets you enhance every rhythm and beat produced by your hands. 3 Microphone inputs & 1 Aux Input with MIC3/AUX selector switch. The Marshall MG Series MG Series MG10CF 10W 1x6.5 Guitar Combo Amp is an ideal amp for practicing and even playing in small jams. Boasting a bold carbon fibre clad look, solid digital effects and MG's critically acclaimed, analogue tonal heart, the MGCF Series has arrived and is already the practice amp choice of some of the world's leading players. Marshall Guitar amps are the hot favorites, of professional stage musicians, rental companies, as well as amateur guitarists. The legendary tones of these amps make them a class apart!